If you log in to inniAccounts today you’ll no doubt notice that we’ve released a significant update. The entire user interface has been redesigned, and we’re also launching three new features, as well as our new Android app. Our previous user interface has stood the test of time well, but was starting to show its age. If you’re a widescreen user your real estate was going to waste, if you use a tablet the experience was less than optimal. Parts of the software were inconsistent and, as we’ve added features over the years, the navigation has become more and more complex. That’s why we’ve redesigned the user interface from scratch, bringing much-improved support for both wider screens and tablets alike. We’ve moved and improved the navigation bar, allowing you to quickly move around the app with fewer clicks, plus it can be collapsed for smaller screens. We’ve also redesigned a number of key parts of the app, and today we’re launching three new features: bank statement importing, customisable invoice templates and a personal tax planner. For some time we’ve supported automatic statement feeds for Barclays and HSBC accounts, and today we’re building on this feature by allowing you to import statements you’ve downloaded from your bank. 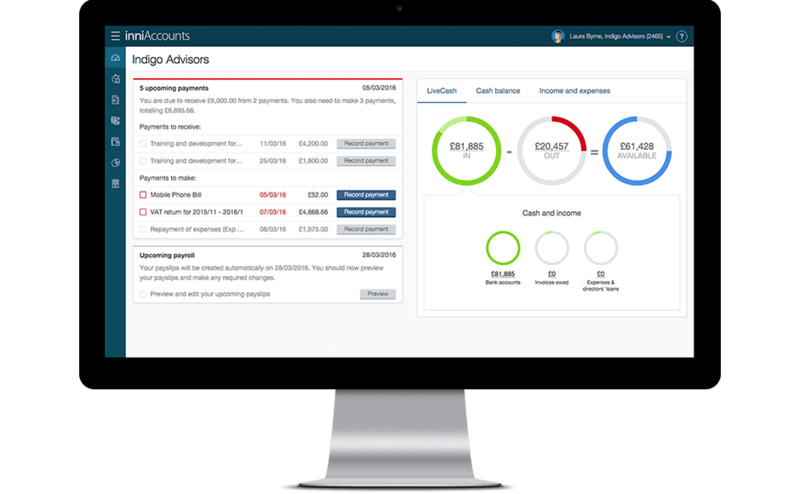 It’s now possible to drag-and-drop statements from Santander, NatWest, RBS, Lloyds, and Cater Allen into bookkeeping. Plus, for advanced users, we also support importing of CSV files. It’s simple to get started. Head to bookkeeping and press the ‘Setup statement importing’ button and follow the step by step instructions. Once your statement is imported it’s a quick job to check off your transactions. One of the most-requested features over the last year was invoice personalisation, which today we’re delivering. It’s now possible to choose from one of three invoice themes (more coming soon), and personalise the colours, fonts and messages, as well as adding your company’s logo. Plus, if you’re comfortable with HTML/SCSS, you’ve got the freedom to take your personalisation to the next level. You can customise any of the themes we’ve provided, or even create your own from scratch. We’ve even created a design kit to help you fine-tune your layouts – grab it from GitHub. To start personalising your invoices simply select the “Invoice branding” link from the navigation bar. As you’re no doubt aware, from April 2016 the way dividends are taxed will be changing. To help you understand the impact, and to better plan your salary/dividend split, we’ve developed a new and comprehensive personal tax planner. You can use the personal tax planner to forecast and breakdown your income tax, by type and tax rate. You can try out different scenarios and instantly see the impact on your net income. It includes calculations for both this tax year and next, and supports the new dividend allowance. When you log in, you’ll immediately see your new company dashboard. We’ve improved the reminders to make them more helpful, and made better use of space by grouping together all of your upcoming payments. We’ve also fixed a long-standing annoyance for clients with overdrawn director’s loan accounts where it was shown as a negative outgoing. It now appears as an incoming amount. If you’re an Android mobile user you can now download the inniAccounts mobile app. It allows you to track time, expenses and mileage on the go and automatically syncs with your accounts. You can download it now from the Play Store. If you’re an iPhone user we’ll be launching an iOS app later in the year – remember you can still use the mobile website for the time being. Thank you to all of your suggestions made via your quarterly satisfaction survey. Remember, if you’d like to be the first to try new features please contact your account manager today. With the new software upgrade, I have found that I am unable to enter any expenses under “repaid via payslip” as it always highlights the date in red and will not allow the entry to be saved. Entering expenses under “repaid directly” still works. Please can this be corrected asap? Hi Stephen – there was an issue this morning with entering expenses in the past. This has now been resolved.